The board is Namco System 2 with a JAMMA connector. There are two other connectors on the board - both unused. 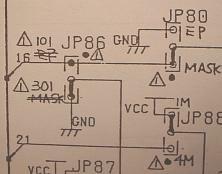 The schematics on the manual offer some hints as to what these connectors were designed for. Unused 48-Pin Edge Card, next to the JAMMA connector. (see manual, p5-29) Note that this card edge isn't connected to the backplane. If you want to use it, you'll need to open up the metal cage to get directly to the PCB. This connector outputs Stereo sound! It just so happens the that sound connector uses the same pin widths as IBM PC connectors. I used an old MFM drive cable, but a floppy cable would have worked too. It's small enough to fit between the PCB and the backplane. Since the cable's connector was too small, I cut one end open with a Dremmel tool. I can get away with that since all the pins I care about are on that one side. It is possible to connect this wrong- be carefull! Once you've wired up the headphone connections (see chart below), you can test the left/right orientation with the system's test mode. Play the FM sound #20- it will play a sound on left and then the right channel. Note that the volume control knob behind the coin door only affects the mono speaker. The headphone connections aren't affected. A6 GOUT(0) CPU connection. Possibly shutter glasses?? A12 >>RINGINK or network connection?? A15 ?? Connection to an IO chip?? Unused 62 pin DIN connector on the bottom center of the PCB. (see manual p5-45). This connector goes straight to the "OBJ ROM" set of ROM chips. There are some near by jumpers, one of which directly powers off the built-in ROMs. My guess is that this connector is an expansion port for new levels. Plug in a card with some ROMs, move a few jumpers, and wa-la! You have a whole new game! I'm not skilled enough to create a new add-on card, but it does appear that it's functional. Stereo sound. It's stereo on the board, but the cabinet has 1 speaker! Awkward wording on screens "you now proceed to next stage" and "many thanks for your play". The game's end has a reference to the game's storyline, but the explanation is only given in the manual. Odd level names. Perhaps another bad translation? No enemy names on screen. Very little text information given. Board has 3D stereo sound, but the cabinet has one speaker! Game statistics are shown in hex. 2 pages of the manual are dedicated to explaining the conversion from hex to decimal. p1-4: "Your grenades are triple the fire power of your tank's standard shots." Nope, it's the same as 4 shots. p3-5 states that you must weigh 150 pounds to remove the monitor. Interesting.